TAA Compliant. Made in Korea. 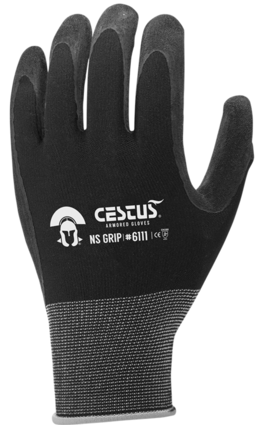 Cestus NS Grip 6111/6116 gloves. Latex Micro Finished Coating gives the glove an excellent grip in both dry / wet conditions and superior non-slip material. With its seamless construction, and light and breathable material, you can work all day and forget you’re wearing them. Available in Hi Vis Lime or Black. This chart must be printed out to use. Please use the chart below to determine your accurate glove size for Cestus.